A judge agreed Friday morning to hear arguments Oct. 1 that could stop Florida’s bear hunt. Speak Up Wekiva Inc. and Chuck O’Neal of Longwood, opponents of the state’s first bear hunt in more than two decades, want Circuit Judge George S. Reynolds III to impose a temporary injunction to prevent the hunt from taking place Oct. 24. The lawsuit alleges the state Fish & Wildlife Conservation Commission has crafted rules that could unwittingly lead to the killing of more than 320 bears, the kill quota established by the wildlife agency. More than 2,100 hunters have gotten a permit. “The FWC is not above the law or common sense,” O’Neal said. Next month’s black bear hunt is a quintessential Florida event, blending our state’s love of guns with its disdain for reason and science. Shoot first, get the data later. “You should have all your science in place before you hold your first hunt in 21 years, especially when you’re dealing with an icon animal,” a hunt opponent told me Friday. That quote didn’t come from some Sierra Club tree-hugger or PETA paint-thrower, but a Broward businessman, hunter and outdoorsman who answers his phone by saying, “Alligator Ron.” That would be Ron Bergeron, a Florida Fish and Wildlife Conservation commissioner who voted against the hunt. Alligator Ron was on the losing end of a 3-2 vote earlier this month. That’s bad news for bears. Not long ago, Florida’s black bears were considered a threatened species, numbering only a few hundred. They have rebounded to an estimated population of 3,100. Starting Oct. 24, roughly 10 percent could get wiped out in a week. The commission decided to allow an unlimited number of hunters off up to 320 bears, a curious decision because Bergeron said they haven’t even gotten updated bear information in all the hunting zones. Bergeron still hunts one deer, one turkey and one hog a year, but he won’t be taking aim at any bears next month. “Until all of the science and stock assessments are in and show that we have a sustainable bear population and we have a population greater than the balance of the food chain, this seems premature,” Bergeron told me. State Rep. Frank Artiles, R-Miami, has no qualms. 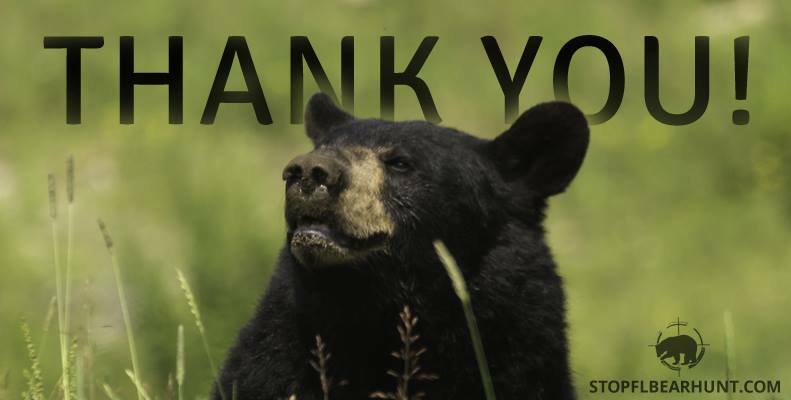 He’s among the 2,100 (and counting) who’ve paid for bear-hunt permits. “This is to sustain a population, not to eviscerate it,” Artiles said Friday. Artiles said thinning some older aggressive male bears will allow younger bears to stay in their natural habitat. Part of hunt supporters’ rationale: Bears have become a nuisance in some populated areas in central Florida, foraging through trash for food. “One thing I hope this hunt will do is train bears to be afraid of humans again instead of there being no repercussions,” Artiles told my colleague Dan Sweeney last week. A better solution than a widespread hunt, Bergeron said, would be bringing bear-proof trash cans to the 14 counties where nuisance bears have been reported. And Bergeron led an effort to halt the harvesting of palmetto berries from state land, giving bears a better chance of finding meals in the wild. “We were taking away their natural food,” he said. Next month, hunters will try to take away much more. Come Oct. 24, I’ll be rooting for the bears. Here is MY letter to the editor at our Stuart News. What is going on now in reaction to the Florida bear hunt is not a circus. It’s the reaction of most Floridians. Most of us are fine with hunting. We have many things in Florida you can hunt. In Florida, if it moves you can shoot it. Unless it is protected. There will not be any land to hunt on because it going to be full of shopping centers and no-lot-line houses. There will be no hunting because there will be no place to hunt. When I spoke to a representative from the Florida Fish and Wildlife Conservation Commission last year the plan was education. The issue was humans feeding the bears. There was no doubt about this. People needed to be educated. There was a bill approved by the Senate that made it a third-degree felony to feed the bears. So instead of educating people we’re going to charge them with something that is as serious as possession of cocaine. Makes sense only because we live in Florida. We don’t fix things in Florida like normal people. Logic has no home here. The downlisting came after the U.S. Fish and Wildlife Service was petitioned by Pacific Legal Foundation, a private property advocacy group in Sacramento, California. So let’s all settle down and do what needs to be done for our black bears. Stop the hunt. Educate. If you can please take a moment and vote on our poll. We just have a few days left. This entry was posted in black bears, florida politics and tagged bear, chuck o'neal, cyndi lenz, florida, florida bear hunt, speak up wekevia. ← Coloring Books and Meditation. What’s up with this? Why meditation is so good for us.